Standards will always have their place in jazz, but sometimes, by necessity, new material also must enter the mix in order for the music to retain its resonance. By the late 1950s, an up-and-coming crop of performers had become firmly established as masters of the old idiom. Yet, they also were itching to break free from tradition and leave an even greater mark upon the genre. One by one they found unique ways of expressing themselves, and as the burning intensity of their approaches grew into raging firestorms of fresh ideas, jazz was forever changed. With Kind of Blue, for example, Miles Davis shifted the underlying structure of his work by refocusing his attention away from simple chord progressions and toward sketches that were based upon modes. Meanwhile, by using a piano-less quartet on The Shape of Jazz to Come, Ornette Coleman removed the tethers from his melodies; in the process, he introduced the world to the concept of free jazz. Pianist Dave Brubeck, on the other hand, followed a completely different train of thought while crafting his stunning masterpiece Time Out. Nevertheless, the result of his work undeniably had an equally profound influence on music, one that has stretched far and wide in the years since the album’s release. As Brubeck explains in the documentary that is included in the newly minted Legacy Edition of the endeavor, Time Out’s genesis emanated from an unlikely source: the off-kilter, clip-clop pattern of a horse’s hooves. Once this kernel of an idea was planted in his brain, Brubeck ran with it. He began to hear intricate cadences everywhere — from the performances of Turkish street musicians to birdsongs to rippling brooks. As he built compositions around an array of unusual time signatures, he inevitably unlocked the typical rhythmic parameters that had kept jazz completely confined. Neither Brubeck nor most of the executives at Columbia had expectations that were very high for Time Out. In the end, though, it was an enormously successful outing, partially because it spawned the smash hit Take Five, which ultimately pushed the endeavor to become the first million-selling album in jazz history. 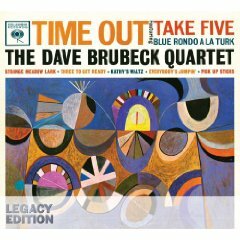 Take Five, along with its flip-side Blue Rondo a la Turk, has since become a standard, and in truth, there isn’t a track on the collection that doesn’t continue to hold sway over even the most casual listeners. The distinctiveness of Brubeck’s approach leant a mysterious appeal to Time Out. Nevertheless, the album never would have achieved its long-term durability if he and his ensemble hadn’t transformed the outing into something more than an academic exercise. The tension created by the unusual rhythmic volleys, which were driven as much by Brubeck as they were by drummer Joe Morello, is swept away by saxophonist Paul Desmond’s swinging, melodic strut. As a result, the shifting time signatures that anchored the material were delivered in a remarkably effortless fashion, almost in spite of their inherent complexity. There is no doubt that Time Out, much like Davis’ Kind of Blue, is as easily accessible as it is intellectually stimulating. Time Out: Legacy Edition has been equipped with a time capsule of photographs set to Take Five as well as a multi-angle piano demonstration that highlights Brubeck’s graceful dexterity. The overall effectiveness of the collection’s presentation is further bolstered by an eight-track selection of previously unreleased material from the Dave Brubeck Quartet’s appearances at the Newport Jazz Festival in 1961, 1963, and 1964. Mixing standards — such as W.C. Handy’s St. Louis Blues and the oft-played classic Pennies from Heaven — with original material — including urgent readings of Take Five and Blue Rondo a la Turk — the concert fare radiates the outfit’s brilliance at every turn. Time Out was too groundbreaking to be overtaken by anything else that Brubeck ever did, but at least it now has been given a fitting rebirth.